Everyone has to follow the rules, even the Easter Bunny. 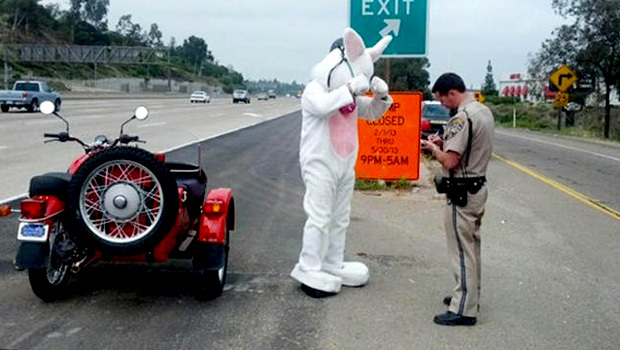 California Highway Patrol made an unusual traffic stop on a Southland highway early Saturday morning when a man in a bunny suit was driving a motorcycle without a helmet, CBS Los Angeles reports. Brian Penning, a CHP public information officer, told the station an officer was on a routine patrol on Interstate 8 when he observed the costumed man traveling down the highway near San Diego. Pennings said the officer proceeded to make a traffic stop after noticing the man's tall white ears were not covered with a helmet. He also said the costume posed a safety concern, as it was a visual impairment. The man told the officer he was headed to a charity event. He was given a verbal warning, but was not issued a citation. "This was the first time I'm aware that we got the Easter Bunny on a motorcycle," Pennings said. He added that CHP has stopped vehicles with driver dress as Santa Clause and other costumes.